This article was originally written for our newsletter in 1994. During the mid 1800’s, the learned art of cabinet making and carpentry began to flourish. It seems only natural that with the forest’s richness of lumber and the abundance of mahogany, (carried as return ballast from ships that had sailed to South America) that eventually several craftsmen would be plying their trade in the St. Croix River Valley. John Warren Moore, one of the area’s most famous cabinet makers, was born in Moores Mills, NB, in 1812. Although it is not known from whom he learned his trade, we do know that there was no really competent cabinet maker prior to 1830, living in either Calais or St. Stephen. Most likely he apprenticed in Saint John, NB or Nova Scotia. John Moore married Mary Louise De Wolf, of Windsor, N. S., in 1833. She was the daughter of Dr. John B. De Wolf, a prominent figure in the history of the Maritime Provinces. Mary Louise was presented upon her betrothal to John an oval-shaped trinket box fashioned from birch by the “groom-to-be”. Moore’s furniture pieces are now considered treasured and valuable antiques. He enjoyed working with mahogany and cherry woods, in later years using walnut. 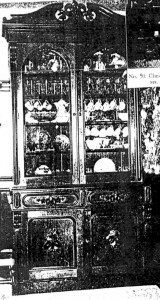 Mahogany became very popular in provincial N.B. and up until 1850 was allowed into the province duty-free. Moore had a definite skill for wood carving, his earlier works show rope carved legs and posts. One of Moore’s desks, beautifully done, bears his signature. It was a wedding gift to his son, Edward Moore, whose wedding to Miss Agnes Holmes, took place in 1865. (Agnes was one of Dr. Job Holmes’s daughters. He was one of Calais’s earliest physicians and lived in the Holmes Cottage before building the Holmestead next door.) 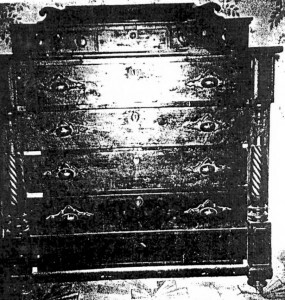 The desk was one of three dozen articles of furniture which formed the collection of Mrs. Frank Flemington, of Toronto, Ontario. Mrs. Evans Hill, of St. Stephen, also had many fine examples of Moore’s work in her King St. home. The Holmestead, former home of Agnes Moore, located in Calais, contains several lovely pieces of furniture by Moore. 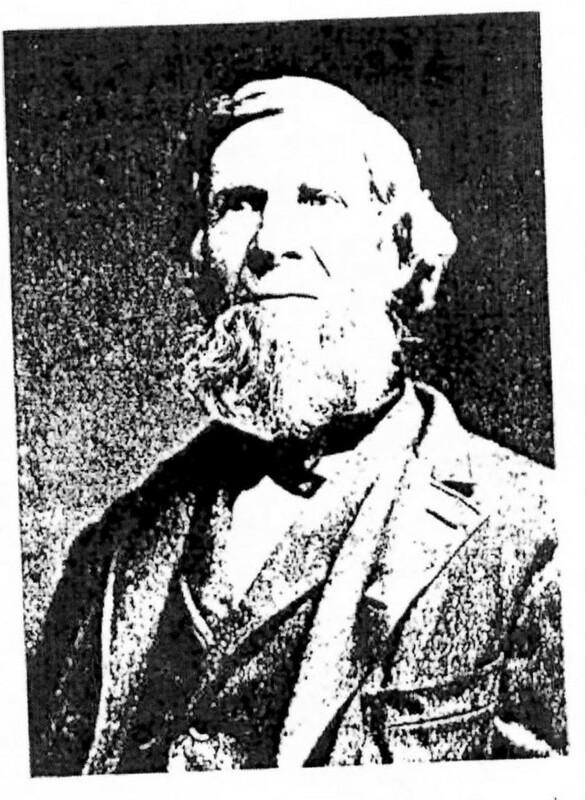 In 1893, John Moore died at the age of eighty-one. 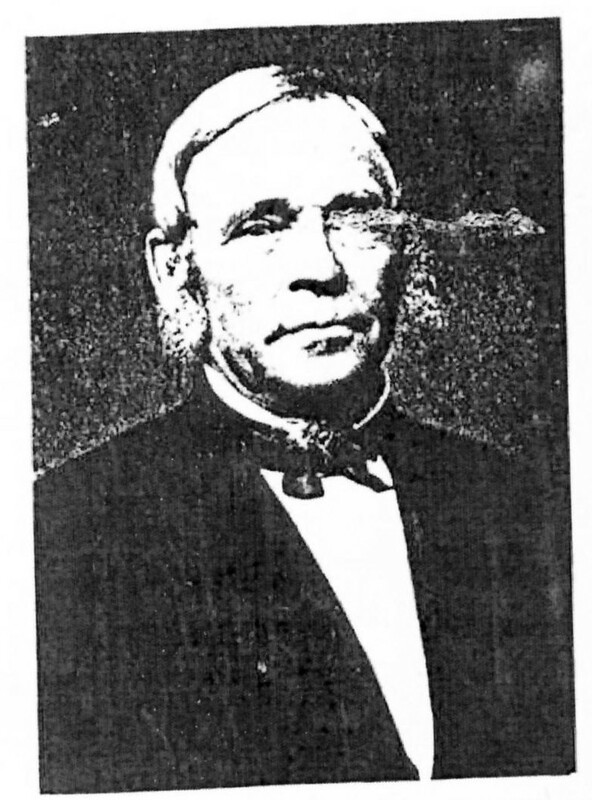 Harry Moore, one of John’s sons, remained in the business with his father until Harry’s death in 1883. Thomas Jefferson Caswell was born in Harrison, ME, in March of 1806. He was the son of Simeon and Rachel Caswell. He was married to Sarah Livermore (1810 – 1878) and was the father of one son and seven daughters. 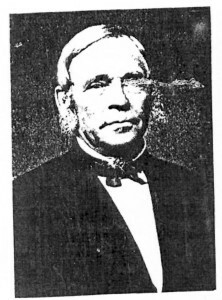 He died In 1894 at Milltown, N.B. at the age of eighty-eight. He was quite young when he and his family arrived in Milltown, N.B. and he subsequently built a large white house on Main Street. (This was built before the brick building, which now houses Jack Reid’s apartment building. T. J. Caswell had a large furniture shop near the river at the end of what was then Elm St. and is now Murchie Ave.
John Moore and Caswell probably worked together at one time as their works bore very similar resemblances. Manufacturer & Dealer in furniture & chairs. Special attention paid to Birch and Pine tables, wood bottom CHAIRS, SETTEES of any kind or length from the Nursery Cradle to the Public Hall; Cottage & Round Cornered Bedsteads, Chamber Sets of the newest style. The above articles constantly on hand or made to order at the shortest notice. T.J. Caswell’s work and that of John Moore were so similar that it is thought that both men were apprenticed to the same cabinet maker. 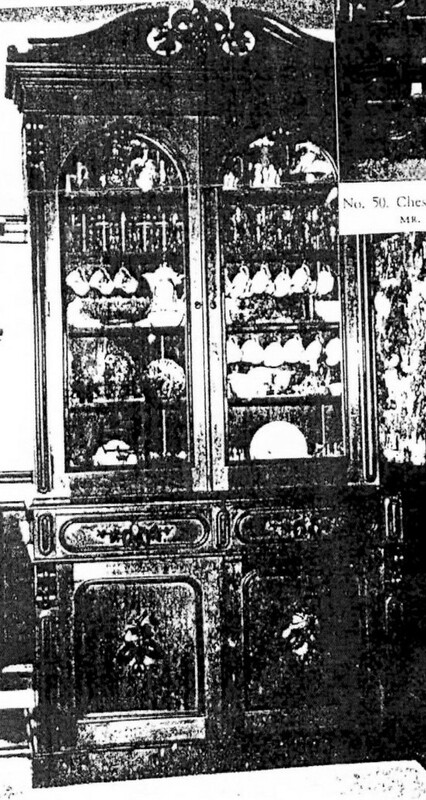 For those young men who apprenticed under a master cabinet­maker hard and fast rules were set and a contract drawn. It was expected to be faithfully followed. Usually five to six years of apprenticeship were common. Young men were not allowed to imbibe spirits, gamble or marry during this time and were expected to serve their master faithfully. The master, in turn, would be responsible for the young apprentice. As well as teaching him the trade, he provided “food, drink and lodging”. Clothing was also provided after the first year as well, to the amount of forty dollars. If the apprentice should be ill for any considerable period during the first part of his apprenticeship the apprentice would to bear an equal proportion of the expense. Schooling was also included and the master saw that the apprentice was taught reading, writing, spelling and arithmetic at least for a period of three months during the apprenticeship. One apprentice known to be taught by Caswell was Eben Thompson. T. J. Caswell’s work were owned by family members, chairs especially, were numerous and varied in styles that spanned 60 years. 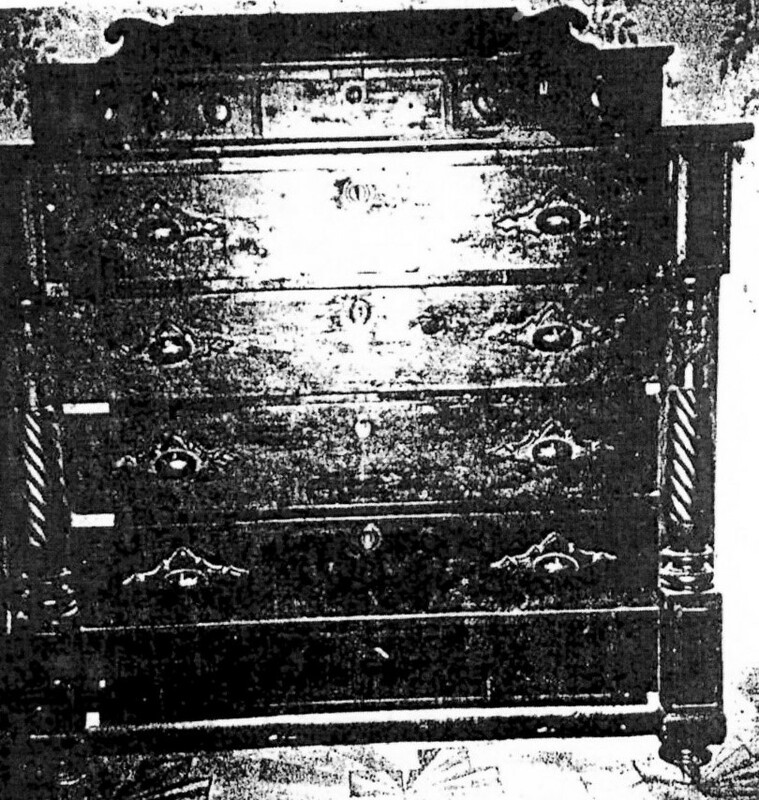 A chest of drawers by Caswell strongly resembled one made by John Moore in 1845. Another furniture company was founded around 1877 by William Frederick Vroom (1850-1932). It was quite successful and within ten years they had a larger furniture showroom at the corner of Water and King Street in 5t.Stephen. Their factory was located on the bank of Porter’s Mill Stream (Dennis Stream today.) A cabinet maker for Vroom Bros. was Cornelius Manuel. He worked with the Vroom furniture till it closed. Charles McBride worked in St. Stephen in 1875 – 1900. His specialty as well as cabinet making was in laying parquet floors. C.W. Crosby was a cabinet maker in Calais known to be working in 1862.